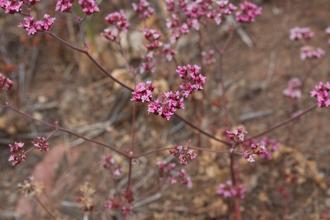 California buckwheat is a ubiquitous member of the plant community known as the California chaparral. This low, evergreen shrub is seen covering our hillsides in its pale blooms for roughly half the year. White to pale pink flowers develop in walnut-size balls at the ends of branching stems from April to November; once bloomed they remain on the plant in a drier, browner state. Often the flower heads cover the plant such that one barely notices the foliage, which bears a resemblance to chamise. Evergreen, narrow, leathery leaves, less than an inch long, are gathered in bunches along the stems which are up to 5 feet long. The species name fasciculatum means "bundles". You would be right to recognize the hairs on the leaves as being one of the characteristics of drought tolerant plants. While the commonness of Buckwheat in our mountains may be a deterrent to choosing this plant for your garden, the abundance of long-blooming flowers, drought tolerance and its attractiveness to native bees and other insects would make it a nice addition to any landscape. Another Buckwheat common to our mountains is Ashy Leaved Buckwheat. Leaves are different in appearance and color. The common name refers to the gray tinted leaves. Last modified: May 13 2017 20:01:52.